2.1 The Top 7 Things to Consider When Buying a Faucet Water Filter! 3.1.1 How Does A Faucet Water Filter Work? 4 What Does The Faucet Water Filter Block? Faucet mount water filters represent the most convenient water filtering solution because they’re cheap, easy to install, and they have low maintenance. But did you know the best faucet water filter models can remove up to 70 different types of contaminants? In the following article, we present the top 6 faucet water filter reviews, and we reveal their pros and cons. Further, in the article, we explain how a faucet water filter works, how to install one, and what the benefits of using one are. There’s no problem if you don’t have any previous experience using a faucet water filter. Our comprehensive buying guide will explain all the main features of a filter, and how they can benefit you. Read on to find out more about faucet water filters. 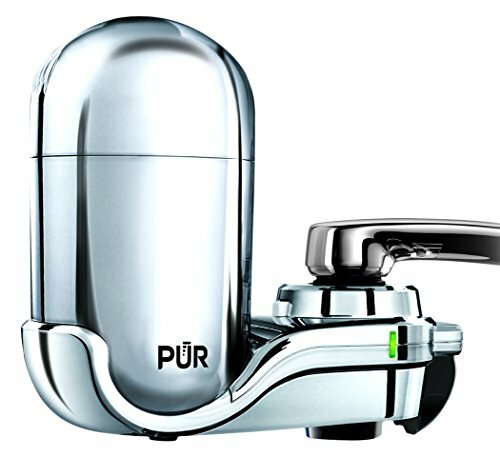 When you don’t want to waste too much time installing a water filter, and you like using products that have a low maintenance, you should take a closer look at the PUR 3-stage faucet filter. This water filter is currently one of the best-selling models on the market, and it’s easy to see why. It has a durable casing that is able to withstand the daily wear and tear, it’s very easy to install, and it comes with a light sensor to notify you when it’s time to change the filters. The filter is very effective. It’s capable of removing 70 different contaminants in the water, so it will make your water healthier and cleaner. Easy Installation – This water filter is very easy to install. It comes with an easy to follow instructions manual that will guide you step-by-step through the process, and you will install it in minutes. Accurate Filter Sensor – The water filter comes with a filter change sensor. The sensor will notify you accurately when it’s time to change the cartridges. Undeserved Bad Ratings – Some people rated this filter poorly, but without a just cause. They claim the filter leaks, but it only leaks when it’s not properly installed. When you want to have a healthy lifestyle, you have to make sure all the things you eat and drink are healthy. You can buy healthy groceries from the supermarket, but when it comes to buying bottled water, the matter is more complicated. Bottled water comes in plastic recipients, so it’s not environmentally friendly. 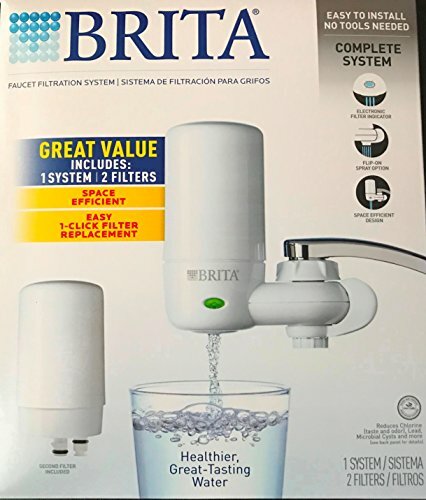 If you want to drink healthy water that’s also green, you should try using the faucet filters developed by Brita. These water filters are very easy to install, and you don’t even need tools for the installation. The filters are also very efficient. They are capable of removing most of the contaminants in your drinking water, ensuring you will drink only good tasting water. Good Tasting Water – Brita water filters are very efficient at removing the bad smells and tastes from the water. Using them will make your water taste better. Small – These filters are small, so they won’t take up too much space. 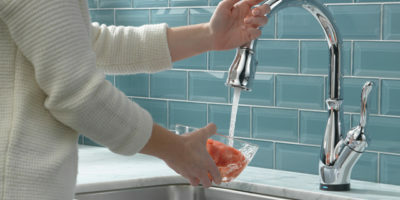 Faulty Light Sensor – This water filter uses a light sensor to notify you when it’s time to change the filter cartridges. The sensor light starts off green, then turns yellow and lastly red. Many customers complained that the sensor died quickly, however, some after only a couple of months. 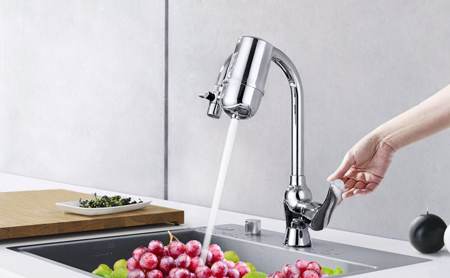 If you’re looking for a water filter capable of removing most of the contaminants in your drinking water, but comes at a reasonable price, you have to take a closer look at the Kabter faucet water filter. This filter uses an activated carbon and KDF55 filter to remove the contaminants in your water. The activated carbon will remove most of the sediment, heavy metals, chlorine, and other contaminants from the water. The KDF55 filter is very good at killing bacteria and preventing the growth of lime, mold, scale, and fungi. The water filter can be mounted on most standard female faucets available on the market nowadays, and using the adapter in the box you will be able to mount it on most male faucets as well. Long Lasting Filters – This water filter uses long-lasting filter cartridges. The cartridges can filter up to 200 gallons of water before they need changing. This means you have to change the filters once every 3 – 5 months, depending on your consumption. Easy To Change Filters – The filter cartridges are very easy to change, and you can do it in under 5 minutes. Instructions Manual Could Be Better – Some people might encounter some problems trying to install this filter following the instructions manual. If this is the case, look for an online video tutorial. If you’re looking for a reasonably priced water filter that’s capable of removing most of the contaminants in your water, you don’t have to look further. You found the perfect model for this description. 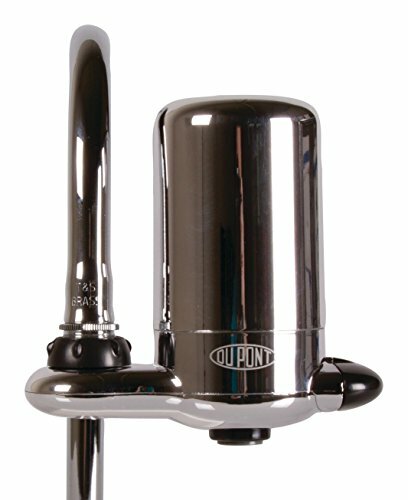 The DuPont water filter comes at a decent price, but it will remove the contaminants from the water just like all the other, more expensive, models. This filter is capable of removing sediment, lead, chlorine, mercury, asbestos, and more. The filter is easy to install, and you will be able to have it running within minutes. The filter cartridges have a filtering capacity of 100 gallons, and the filtered water tastes great. Great Tasting Water – This water filter produces good tasting water. Some customers claim that the water filtered using this model actually tasted better than bottled water. Everything Is Included – The water filter comes with everything you need for the installation, including Teflon tape. We highly recommend using this tape during the installation, otherwise, the filter might leak. Small Filter Capacity – The water filter cartridges are capable of filtering only 100 gallons of water before you have to change them. This means you will have to change them more often. When you want to lead a healthy lifestyle, you have to make a few changes around the house. You have to throw away all the junk food you hid in the kitchen counters, and you also have to install a water filter. Otherwise, why would you stop eating chemicals if you keep drinking them? 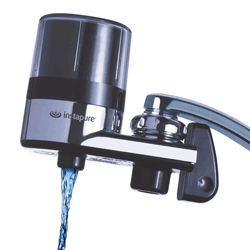 The InstaPure water filter is very easy to install and to secure on the faucet. The filter also comes with a lever that allows you to change between running normal water or filtered water easily. This water filter will remove most of the bad tastes and odors in the water, so you will drink healthier, better tasting water at all times. Cheap Replacement Filters – This unit uses cheap filter cartridges. This will lower your expenses. Poor Adaptor – The adaptor that connects the water filter to the faucet is made out of plastic and it can break if you tighten it too much, so you have to be careful during the installation. Using a water filter is a good way to make sure you drink healthy water. Some people might consider bottled water superior to filtered one, but that’s not necessarily true. Filtered water is more environmentally friendly, and you also don’t risk finding plastic residue in your water. When it comes to faucet water filters, the one produced by Culligan is one of the best-selling models you’ll find. With easy installation, and a high filtering capacity, this model is not only very efficient, but it is also cheap. 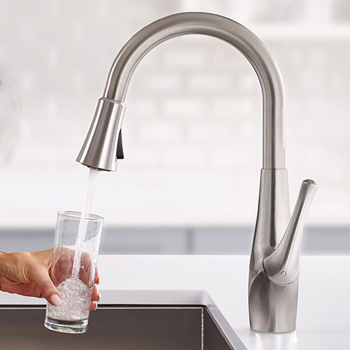 The water filter will fit all standard faucet nozzles, but it won’t fit any pull-down models. Nice Water Pressure – The water coming out of this water filter has a 0.5 GPM flow rate and a pressure of 60 psi. Good Filtering Capacity – The filter cartridges used by this water filter are capable of filtering up to 200 gallons of water before you need to change them. This means the filters will last up to 3 months, depending on your water consumption. Cartridges Can Be Hard To Change – Some customers experienced difficulties when they tried to change the filters. If this happens, you have to be patient, otherwise, you risk damaging the filter. Finding the right faucet water filter can be difficult in today’s crowded market. Every manufacturer claims his products are the best but do you really know if that is the truth or just a marketing scheme? To help you in your decision making, we decided to create a short buying guide. 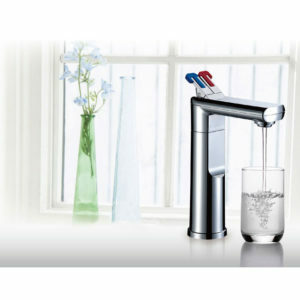 This guide will reveal the most important features of a faucet water filter, and it will explain each one individually. After reading the buying guide, you should be able to make an informed decision and choose the best water faucet filter for your home. The Top 7 Things to Consider When Buying a Faucet Water Filter! Faucet water filters usually have roughly the same size, but some models are slightly larger than others. The size of the filter is closely related to the size of the water filter cartridge. The larger the cartridge, the larger the filter. The size of the faucet filter is not very important to the way the filter actually works. However, the size of the filter is very important to how much space it will occupy. Maneuvering dirty plates around a water filter is not an easy thing to do if your kitchen sink is tightly packed, so you should look for a smaller model. If your sink allows you plenty of room to move around, there should be no problems if you choose a large filter. Now, most of the faucet water filters we reviewed work in a similar way. They don’t look similar though, so you should be careful when you decide on one. The water filters come in different finishes, and you shouldn’t encounter any problems looking for a finish that matches your other fixtures and appliances. We have a recommendation when it comes to choosing the right finish for the water filter. Try, when possible, to avoid choosing the white plastic finish. This finish rarely matches anything in your kitchen, and it might look off. You should always try to choose a finish that at least matches your faucet. This is an important feature of a faucet water filter. The fact of the matter is, most of them are very easy to install, and you won’t even need a tool to install them. However, you might need an adjustable wrench to unscrew the aerator off your faucet if you can’t do that by hand. Some water filters do need some tools or materials for the installation, but most manufacturers include everything you need in the product’s box. It’s important to have an easy to install filter because you might need to take it off when you need to change the filter cartridges. This is not a necessary step in the replacement process, but the filter’s position might make the change more difficult. Faucet filters manufacturers usually design their products to fit in two styles. One will allow the filters to rotate around their axis. This is a nice feature because it will allow you to move the filter out of your way when you’re doing dishes. The second style doesn’t allow the filters to rotate around their axis, but it allows them to swivel on the vertical axis. This also allows you to have an unhindered access to the sink when you need it. Since both styles allow you to use the faucet without getting in the way, they are both good, and it’s only a matter of preference if you decide one or the other. However, you shouldn’t look only at the buying price of the water filter. When you decide on a filter model, make sure you take a quick look at how expensive the replacement cartridges are. Some cartridges are cheaper than others and they will lower your maintenance costs significantly. The filter cartridges are the most important components of the faucet water filters. They are the ones that remove the contaminants from your drinking water. This is why you should know more about them before you make a purchase. Most of them are heavy-duty cartridges that remove most of the contaminants in the water. Some are so efficient at removing contaminants, they can eliminate up to 70 different substances from your drinking water. However, the filter cartridges have a limited lifespan. Some of them come with a recommended filtering capacity, like 100, 200, or 300 gallons. These models most often use a filter change sensor to notify you when to change the filters. Other models come with a periodic filter change recommendation, so you know you have to change them every 1, 2, or 3 months. A few have mixed recommendations, so you can either change them after they filtered 200 gallons of water or once every two months. You should always respect the manufacturer’s filter change recommendation. The filters pass several tests before they are released on the market, and if you respect the recommendations, you can be sure you’re always drinking healthy filtered water. If you don’t follow the recommendation and fail to change the cartridges, you can drink contaminated water instead of filtered one. – This is the most common filter change sensor, and you can find it in different shapes on many products produced by different manufacturers. The colors used by the sensors are the same, though, so you can use them all in the same way. The sensor’s light starts off as green. When the filter cartridges are close to their maximum filtering capacity, the sensor’s light turns to yellow, so you know you have to order a new cartridge, or so you can go to your local shop and buy one. When the filter reaches its maximum filtering capacity, its light will turn red. When the sensor’s light is red, the water you drink won’t be completely filtered, so it won’t be as healthy. – This type of sensor is usually used for water filter pitchers, but there are some faucet water filters that use it as well. This sensor counts the days since you last changed the filter cartridge. When you change the cartridge, you reset the counter. This sensor doesn’t notify you when it’s time to change the cartridge, but you can read how many days passed since you last changed them every day, so it’s still easy to keep track. 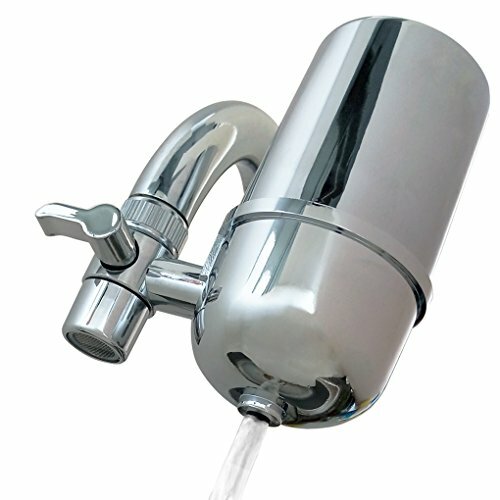 Faucet water filters provide an effective solution to remove the contaminants from your drinking water. However, some people confuse the terms water filter with water purifier, or they consider them synonymous. This is far from the truth. A water filter removes some of the contaminants in a water source. The number of contaminants removed depends on the filter’s efficiency and the quality of the water. A water purifier makes sure that less than 10% of the contaminants in a water source reach the faucet. However, to achieve this, a water purifier uses more water filters. As you can see, there is a difference between the terms. They actually describe different products. When it comes to water filters, faucets water filters are considered effective. They are capable of removing 10 – 20% of the contaminants in the water. However, some contaminants will be removed in larger proportions than others. That’s why the filtered water will contain little to no traces of sediment, chlorine, or rust. These contaminants will be greatly reduced or eliminated by the water filter, but some will only be removed in a small amount. For example, some viruses and bacteria can pass through the filter unscathed. How Does A Faucet Water Filter Work? Well, no matter how they’re called, most faucet water filters work in the same way. They use different layers to remove some of the contaminants in your water source, and they do it fast. 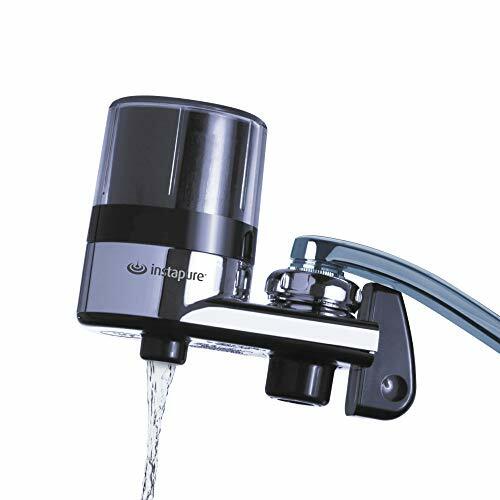 When you turn on the faucet, the water passes through a filter screen that protects the water filter. This screen can be made out of woven or non-woven mesh, and its role is to block the larger contaminants. This is where the rust particles, sand, debris, and dirt stops. After the water passes through the screen, it reaches the second layer. This is usually a thick block of compressed activated carbon. Activated carbon is made out of nut shells, wood, peat, coconut husk, or lignite, that is activated through a physical or chemical process. Most faucet water filter manufacturers prefer using charcoal activated through a chemical process, which implies impregnating the carbon with certain chemicals. Some of the chemicals will also grant some additional properties to the carbon, so it will be more effective at killing bacteria. The activated carbon is very porous. In fact, the carbon is so porous that just one gram of carbon has the equivalent surface area of 32,000 square feet. The whole surface of the carbon is full of nooks and crannies, and thanks to a natural process called adsorption, the contaminants are attracted to the carbon’s surface. When the contaminants reach the activated carbon layer, they are attracted to its surface, and they will enter its pores. They will be trapped there, and your water will be less contaminated. The more time the water stays in contact with the carbon filter, the more contaminants are blocked. This is why most water filters reduce the faucet’s water flow dramatically, so the water spends more time in contact with the carbon filter. After the water exits the carbon filter, it reaches the faucet and it’s suitable to drink. 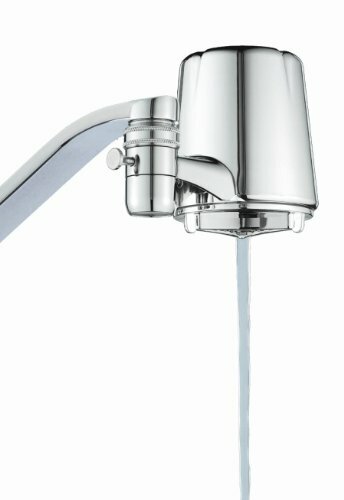 What Does The Faucet Water Filter Block? You might be wondering what a faucet water filter is capable of blocking, and what it’s not. Well, we have good news for you. First of all, the water filter will remove the chlorine from the water. This will greatly improve the water’s taste. Second, the filter will also remove most of the large contaminants like dust, rust, sand, and other debris. This will also improve the water’s taste, and it will make it healthier. The activated charcoal filter is also very good at removing the volatile organic compounds in the water and the smaller sediment that might have escaped the first screen. Treated charcoal can also remove some bacteria and viruses. Lastly, the activated carbon filter will remove all the weird tastes and odors in the water, making it healthier and easier to drink. There are a lot of benefits for using a faucet water filter. Unlike other water filters that might be big and bulky, the faucet water filters are small and easy to install. You don’t need to constantly wait for a water tank to fill, and you don’t have to fill any pitchers. The water is filtered as soon as you turn on the tap. A faucet water filter might not be as effective as a water purifier, but it will remove a lot of different contaminants from the water. Effective filters can remove up to 70 different contaminants from your drinking water. These contaminants include but are not limited to lead, mercury, chlorine, and others. One of the major advantages of using a faucet water filter is that it will remove any weird tastes and smells your water might have. This will make the water taste better, and it also makes it healthier. Unlike other water filtration solutions, faucet water filters are very easy to install, so you should be able to install them on your own in minutes. This is a major advantage, as it will lower the overall cost of the filtration system. Faucet water filters are some of the cheapest water filtration solutions. They don’t cost too much, they can be installed without professional help, and their filter cartridges can be changed easily and they are cheap as well. Unlike other water filtering systems, faucet water filters have low maintenance. You only have to change the filter cartridges when they reach their maximum filtering capacity, and that’s pretty much it. Using a faucet water filter is more environmentally friendly than buying bottled water. It’s estimated that a single filter can replace the amount of water you can buy in up to 750 bottles of water, and it does it without throwing anything away. Faucet water filters are also considered environmentally friendly because they don’t waste water. Most purification systems waste a small or large amount of water when they filter it. This type of system filters the water without wasting it. Unlike other water filtration systems, faucet water filters allow you to change between using filtered and unfiltered water. And the best thing is, you don’t even have to struggle to do so. You just have to turn a knob and the water source is switched. Faucet water filters are very easy to install. Most of them don’t require additional tools or materials for the installation, and the whole process shouldn’t take more than a couple of minutes. The models that need some materials to install usually come with them in the package, so you can proceed to the installation without additional costs. Here’s a short guide on how to install a faucet water filter. Most of these filters won’t work on pull-down faucets, so look after another filtering solution if you own such a faucet. Remove The Faucet’s Aerator – This is the only step that might require you to use a tool. If you can’t remove the aerator by hand, you should use an adjustable wrench to do it. Keep in mind to remove the washers in the faucet if there are any. Clean The Buildup – Depending on your faucet’s age and how hard the water source is, there might be some build up under the aerator. Clean it using vinegar. Check To See If You Need An Adaptor – Most faucet water filters can be installed directly on the male faucets, and only using an adaptor when they’re installed on female faucets. Attach The Filter – Attach the filter to the faucet, and make sure it’s twisted in place. After the mounting collar is attached, insert the filter cartridge. Flush The Cartridge – Let the water run for 5 minutes before you taste it. This period is necessary to flush out the cartridges and remove the carbon excess. To clean the water filter, you can use the same cleaning solutions you would on your faucet. When it comes to replacing the filter cartridge, just take the old one out and insert the new one. 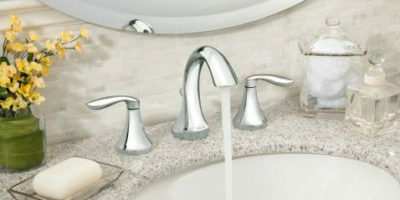 You May Also Like: What is the best kitchen faucet? Also, check out the best selling bathroom faucets and touchless kitchen faucet reviews for the most popular models online today! We’re convinced that after reading our faucet water filter reviews and the short buying guide we presented you had no trouble identifying the best tap faucet water filter for your home. Faucet water filters are easy to install, they’re easy to use, they don’t require much space, and they’re also very cheap to maintain. They are a good alternative to buying bottled water, and they are actually environmentally friendly. When you use a faucet mount water filter, you drink healthier water. The filtered water has better quality, and all the strange tastes and smells will disappear. You should keep in mind that most faucet mount water filters can’t be installed on pull-down faucets, so if you own such a faucet it might be better to look for another filtering solution. Faucet Guide Copyright © 2019. All Rights Reserved. faucetguide.net is a participant in the Amazon Services LLC Associates Program, an affiliate advertising program designed to provide a means for sites to earn advertising fees by advertising and linking to amazon.com.